I believe, like so many other Bible-read unbelievers, that anyone who really explores the horrible cruelties, inconsistencies and contradictions of the Bible will probably lose their faith or at least not believe in the literal Bible. I doubt many Christians even want to take that chance. But why believe in a book you truly haven’t read clearly? There are simply too many verses that have no rational explanations even from apologists. I have read the Bible and it amazes me on how religious people can call this a ‘good’ or ‘moral’ book. It surely is NOT nor is it divinely inspired. one common explanation of the immoral passages is that we (atheists) are not read in it in context – but in what context is is right to kill or harm others? As a recent billboard said, “With Religion, Everything Is Permissible”. and if apologists can explain why it is right to harm others, doesn’t this promote the idea that we to, in this modern society, can do harm to others and have our action be absolved by a deity? 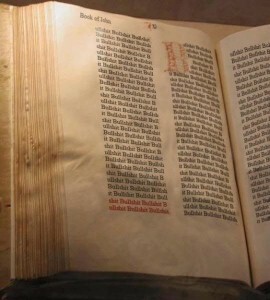 One reason Christians and Catholics do not understand how errant the bible really is – is the fact that many contradictions are in different books. It’s only until you see the contradictions side-by-side that they are apparent. Christians – I simply challenge you to read your own book with some critical thinking. don’t believe everything because some Bible authority has told you everything is true even before you examine it. You will see the thousands of direct and in irrefutable contradictions in the Bible. There are even ‘non-quotes’ which quotes verses of the Bible that are not even in the Bible! (buy and read ‘The encyclopedia of Biblical Erances’ by McKinsey) It is important to know that the Bible commands that it’s believers study the bible COMPLETELY and to ‘test everything’. I find it very odd that when I mention the atrocities of the Bible to Christians, they ignore it or do not want to study it. Maybe they think that I am an atheist that I am trying to deceive them. It is as if quoting their unholy book will take them away from their faith. There are too numerous contradictions in the Bible to mention here, so the only thing I can do is quote other great bible websites that show much more information. Enjoy! God” wanted children to be murdered as human sacrifices: “I let them become defiled through their gifts – the sacrifice of every firstborn – that I might fill them with horror so they would know that I am the Lord.” (Ezek. 20:26)?? “God” threatened to have innocent children be devoured by wild animals: “I will send wild animals against you, and they will rob you of your children, destroy your cattle and make you so few in number that your roads will be deserted.” (Lev. 26:22)?? “God” threatened to have children cannibalized: “If in spite of this you still do not listen to me but continue to be hostile toward me, then in my anger I will be hostile toward you, and I myself will punish you for your sins seven times over. You will eat the flesh of your sons and the flesh of your daughters.” (Lev. 26:27-29)?? “God” ordered the genocide of women, children and babies: “Now go, attack the Amalekites and totally destroy everything that belongs to them. Do not spare them; put to death men and women, children and infants, cattle and sheep, camels and donkeys.”” (1 Sam. 15:2-3)? ?”God” aborted fetuses and murdered children in answer to the prophet Hosea’s prayer: “Give them, O Lord – what will you give them? Give them wombs that miscarry …. Ephraim is blighted, their root is withered, they yield no fruit. Even if they bear children, I will slay their cherished offspring.” (Hosea 9:14-16)?? Suppose you go to war against your enemies and the LORD your God hands them over to you and you take captives. And suppose you see among the captives a beautiful woman, and you are attracted to her and want to marry her. If this happens, you may take her to your home, where she must shave her head, cut her fingernails, and change all her clothes. Then she must remain in your home for a full month, mourning for her father and mother. After that you may marry her. But if you marry her and then decide you do not like her, you must let her go free. You may not sell her or treat her as a slave, for you have humiliated her. One of my favorite reasons why the Bible is so unjust is the killings – over 371,000 by god alone and another 1.8 million by his believers. Why did God kill and command to kill so many sinners if they were going to eternal hell anyway?